After running, jumping, pushing up, and sitting up we get into the meat of the matter. We get to kick and hit things! The next half hour is dedicated to beating the ever living snot out of an inanimate object. We learn and execute jabs, crosses, hooks, front kicks, jab kicks, and round house kicks to name a few. Everything we do, we do to a bag. However, that does not mean that what we are learning is not the real thing. Both the instructors are black belts who demonstrate everything we will do. They break it down into easily understood chunks. This is awesome because if they showed us a combination and said do it without breaking it down into the discrete parts, none of us would have actually seen all the steps that go into executing the moves efficiently and safely. At the beginning and the end of the class, we do some yoga-esque stretches that are intended to help loosen us up and prevent injury. 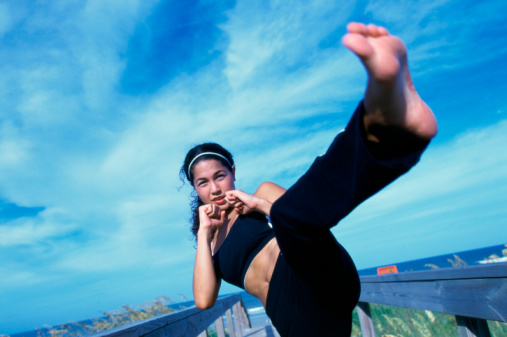 Kickboxing can burn up to about 900 calories an hour. This is great for getting into shape and boosting the metabolism. Because the activity works the entire body, muscles strengthen relatively quickly and universally. Ultimately, the sport is a form of self-defense: you learn the proper way to throw a number of punches and various kicks. I think kickboxing is a great way to learn how to defend oneself while getting into shape. What are your thoughts? Share them in the comments!